Dietary Supplement. Quick dissolve. 100% drug free sleep aid. Promotes relaxation & sleep. Sleep health. Over 40 years of trusted quality. At Nature's Bounty, we are committed to your health. For over 40 years we have been making trusted products, backed by science, and made with only the purest ingredients - guaranteed. So you can get the most out of life every day. Clinically studied ingredient. Natural cherry flavor. Guaranteed quality. Laboratory tested. Nature's Bounty quick dissolve melatonin helps you fall asleep faster so you can awaken refreshed and revitalized. 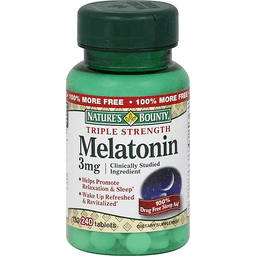 Melatonin is an excellent choice for people experiencing occasional sleeplessness. No artificial flavor, no preservatives, no sugar, no starch, no milk, no lactose, no soy, no gluten, no yeast, no fish. Sodium free. Suitable for vegetarians. Nutrition questions or comments? Call 1-800-433-2990 Mon. - Sat. 9 AM - 7 PM ET. Join our loyalty program at NaturesBountyRewards.com. (These statements have not been evaluated by the Food and Drug Administration. This product is not intended to diagnose, treat, cure or prevent any disease.) Made in the USA with select ingredients from around the world. 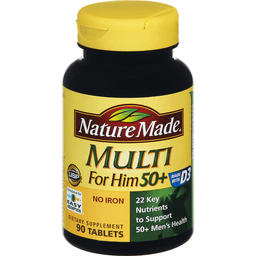 Multivitamin/Multimineral Supplement. Artificially flavored. New look. Questions or comments? Please call 1-800-800-4793 (Mon-Fri 9 am - 5 pm EST). (This statement has not been evaluated by the Food and Drug Administration. This product is not intended to diagnose, treat, cure, or prevent any disease.) Made in Germany. 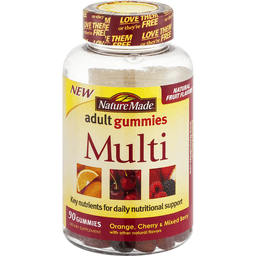 Multivitamin Supplement. Orange. Cherry. Peach. Grape. Artificially flavored. New formula. 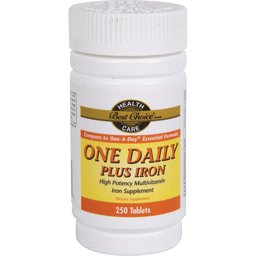 Contains as much iron as 5 cups of cooked spinach. Now with TastiSmooth - deliciously smooth chewables. Pediatricians' No. 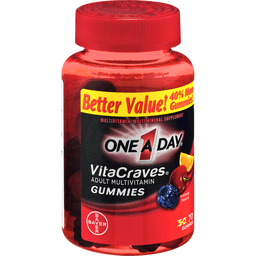 1 choice children's chewable vitamin brand. A complete multivitamin with 12 essential nutrients your child needs to help support: Eye Health - with vitamin A, vitamin C and vitamin E; Energy - with iron, vitamin B6, B12, thiamin, riboflavin and niacin to convert food to fuel; Immune Health - with iron, vitamin C, vitamin E and beta-carotene. Great tasting fruit flavors & fun character shapes. Questions or comments? Please call 1-800-800-4793 (Mon - Fri 9AM - 5PM EST). Visit our website at www.bayercare.com. 4 great flavors! 8 fun character shapes! Fred. Pebbles. Wilma. Dino. Barney. Bamm-Bamm. Betty. The Great Gazoo. (This statement has not been evaluated by the Food and Drug Administration. This product is not intended to diagnose, treat, cure, or prevent any disease.) Made in the USA of US and imported materials. Dietary Supplement. List. No. 1796. L200. Made with D3. USP: Dietary Supplement verified. 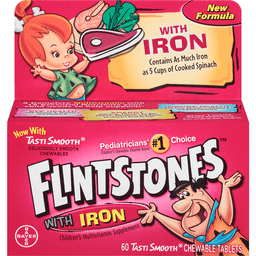 No iron. 22 key nutrients for daily nutritional support. No color added. No artificial flavors. No preservatives. No yeast. Gluten free. www.NatureMade.com. Oil- and water-soluble vitamins with minerals tablets USP. USP has tested and verified ingredients, potency and manufacturing process. USP sets official standards for dietary supplements. www.upsverified.org. Dietary Supplement. List. No. 1790. L200. Made with D3. USP: Dietary Supplement verified. 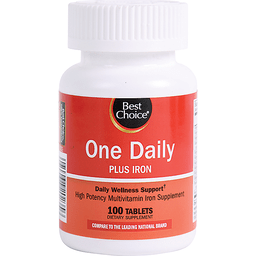 No iron. 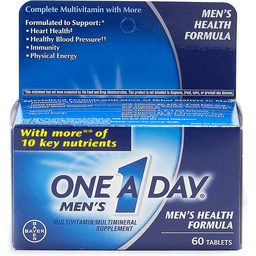 22 key nutrients for daily nutritional support. No color added. No artificial flavors. No preservatives. No yeast. Gluten free. www.NatureMade.com. Oil- and water-soluble vitamins with minerals tablets USP. USP has tested and verified ingredients, potency and manufacturing process. USP sets official standards for dietary supplements. www.upsverified.org. 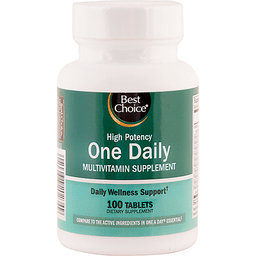 Multivitamin/Multimineral Supplement. With 100% DV of all 8 B-vitamins (Refers to daily values for vitamins B1, B2, B6, B12, niacin, folic acid, biotin and pantothenic acid). 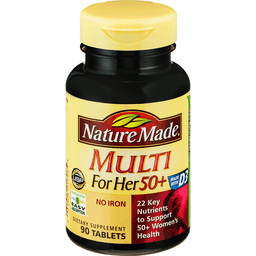 Complete multivitamin with more. Formulated to Support: bone health; heart health (Not a replacement for heart medications); immune health; physical energy; skin health. Specialized formula with more of what matters to women. Formulated to Support: bone health with a high level of calcium and vitamin D; heart health (Not a replacement for heart medications) with vitamins B6, B12, C, E and folic acid; immune health with vitamins C, A, E and selenium; physical energy with B-vitamins and chromium to help convert food to energy; skin health with vitamins A, C, E and copper. 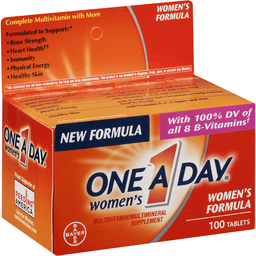 A Complete Multivitamin with More of What Matters to Women: One A Day Women's is a complete multivitamin specially formulated for women. It contains 100% daily value of all 8 B-Vitamins (Refers to daily values for vitamins B1, B2, B6, B12, niacin, folic acid, biotin and pantothenic acid), which help convert food to energy, and 5 other essential nutrients (Refers to vitamin C, copper, manganese, chromium and iron). Does not contain aspirin. Questions or comments? Please call 1-800-800-4793 (Mon-Fri 9AM - 5PM EST). (This statement has not been evaluated by the Food and Drug Administration. This product is not intended to diagnose, treat, cure or prevent any disease.) Made in the USA of US & imported materials.